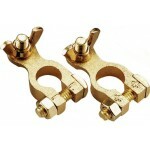 Brass Battery Wing Nut Terminals Set / Pos. 5/16" - Neg. 5/16"
Brass Battery Wing Nut Terminals 1 Pos /1 Neg. Positive and Negative stud size is 5/16"
Clamp-type wing nut terminals convert standard battery post to Marine lug post.